I have always tried to be honest, and within my various blog articles, I have been candid to the point of being “brutally honest.” Therefore, it should come as no surprise that part of my motivation in writing this article is that it seems like my honesty, as is so many times the case, actually costs me money. Remember the old saying, “If you can’t beat ’em, join ’em?” I’m thinking that maybe I should…. My dad said that you could drive a brand new car off the dealership lot, drive straight to any place that offered a free inspection, and they’d find something that needs to be fixed. Years later, and AS A JOKE, I called a number for the “Select Comfort Mattress” to get their “free, no obligation video,” which I passed on to a friend as a gag birthday present. In order to get the video, I had to leave my phone number and address. The “Client Chair,” at least in a Criminal case, is the place where a person coming in for a “free consultation” gets seated, hears about all the potential doom and gloom and penalties (including Jail and/or Prison) and fines and costs and other negative consequences that can befall them, and then learns how the Lawyer on the other side of the table can spare them much of that. It all starts when the Client sits down, and the Lawyer asks, in a manner that seems rather innocent enough, “let me get a little information. What is your name? Your address? Are you married? Where do you work? How long have you been there (I love this one, if it’s asked…) What’s you rate of pay? (i.e., how much can you afford?) When did this happen? Where? What happened? 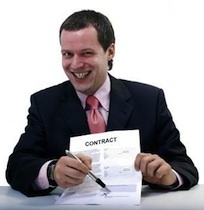 Then, the potential Client asks his or her questions, and the Lawyer answers them, hoping that they walk out having signed a Retainer Agreement. From the Lawyer’s perspective, this is best accomplished by being the first in line. In other words, if this is your tactic, then you want to get the person in as soon as possible, before they see any other Lawyer, who will also try for a “conversion” from “consultation” to Retainer. Chances are, if the first Lawyer is any good, then the second Lawyer will either have a no-show potential Client, or perhaps will perhaps, at least, get the courtesy of a call cancelling the appointment. This really is just a variation of the battle for shelf space in the supermarket. In the Potato Chip aisle, for example, the manufacturers actually pay the retailers for better placement. Eye level is considered the best. Down at the bottom is the least desirable. That’s because most shoppers automatically look at eye level, and usually, once they have put a product in their buggy, they move on to the next thing they need. Thus, if Better Made Potato Chips was given a choice, in supermarket X, of having their products at eye level, or on the bottom row, which do you think they’d pick? The same holds true for all sorts of things. If you leave a sporting event where there are souvenirs sold outside of the venue, the prime spots are those closest to the facility. The farther away from the facility the kiosk, or stand is located, the less likely someone is to buy. First, or closest, is best. Yet I refuse to do this. Honestly, I feel that it’s beneath me to have to pander myself in such a manner. There is little doubt I’d make more money if I were to simply bring everyone in for a free in-Office consultation, use a few high-pressure or scare tactics, and make myself out to be the person who can rescue the Client from all they face. And it would be better still if I could get them in first, before they sat down with any other Lawyer. But I’m better than that, and truth be told, I want a Client who is smarter than that. If the real reason I am hired is only because I’m so aggressive by bringing them right in, then that means I’m not being selected for my ability, experience, knowledge, personality or skill, as much as the fact that I simply know how to “close the deal” and convert a call into a paid Retainer before the potential Client talks to anyone else. Instead, I want a Client who has the fortitude and intelligence to do their homework. I want to be selected. Personally, I’d NEVER go into anyone’s Office, for anything, until I was satisfied that the person might be a good fit for what I need. I need to have some questions answered first. In my case, I’ll answer any and all questions a person has right over the phone. You don’t need to make an appointment and miss work to ask your questions, and have me explain things. And why should you? I think a mistake many people make is thinking that they’re too smart to just sign up with the first person they see. I know, for a fact, that as bright as I think I am, I am exactly the kind of person who might do just that. After all, I’ll wind up telling myself, I’ve taken my valuable time, and then taken another person’s valuable time, and they seem nice enough, and competent enough, so why waste any more time…. I will gladly spend as much time with a person as it takes to explain things and answer their questions, but I like doing that by phone, which is much more convenient, anyway. Besides,doing a consultation by phone, at least from the point of view of the caller, means there is a decided absence of high-pressure tactics, like the proverbial “Client Chair.” And whether done by phone, or in the Office, the same confidentiality rules apply to anything that’s discussed: It’s private, and covered by Attorney-Client Privilege. That “Privilege” legally applies to conversations even just for the purpose of consulting with a Lawyer for the purpose of deciding who to hire. Yet time and time again, I hear of Lawyers being evasive about this until the person comes in and provides some information. Talk about red flags…..
Not to be mean about it, but the more of this I see, the more I realize P.T. Barnum was right when he said, “There’s a sucker born every minute.” Barnum is also generally credited for the line “Never give a sucker an even break,” which became the title of the 1941 W.C Fields movie. I guess living by the motto “Treat others as you wish to be treated” is at odds with those rather profitable philosophies, but it is the credo by which I live, and by which I do business, and by which I hope that I am, in fact, treated by others. The moral of this story, I suppose, is just that I do my consultations by phone, and that I am skeptical of those who don’t. So, while I may not have quite “joined ’em,” do remember, for any Criminal case (including DUI) arising in Macomb, Oakland or Wayne County, I offer a 100% COMPLETELY FREE PHONE CONSULTATION. I hope you pick up the phone and call. And if you do, I promise to be honest, even if that means telling you what you need to hear, rather than just what you want to hear.